Discovery is in trouble-free flow, with all of her recent processing “highlights” now at a conclusion. They include the re-installation of her three Space Shuttle Main Engines (SSMEs) – following an issue with a turbo pump on Main Engine 1 (ME-1), and the re-installation of her Right Orbital Maneuvering System (ROMS) pod. As part of the re-installation of the ROMS, engineers are scheduled to perform isolation valve verification tests on the right hand OMS pod piping and test the heater and thruster for the Right Reaction Control System (RRCS) during the early part of this week’s flow. Over the weekend, engineers connected two anhydrous ammonia bottles to the orbiter using Quick Disconnect (QD) lines to service Discovery’s ammonia boiler system. The ammonia boiler system is used on the runway prior to ground cooling and supports an emergency return and landing in the unlikely event it is needed. This work has been previously delayed due to leaks in the associated Ground Support Equipment (GSE), which was repaired for the weekend task. “OV-103 (OPF Bay 3): Ammonia servicing was completed over the weekend. SSME heat shield installations were completed Friday. 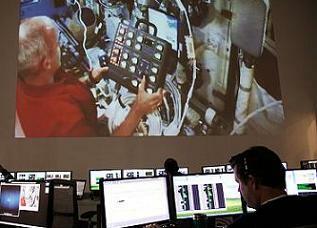 Splice line closeouts are scheduled to begin,” noted the NASA Test Director (NTD) processing latest (L2). 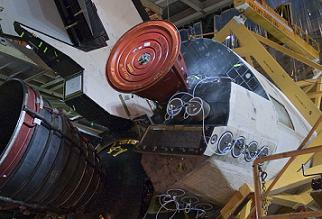 Orbiter Instrumentation Unit (OIU) checkout and testing was completed on Friday. Over in the Vehicle Assembly Building (VAB), engineers are working through closeouts on the mated External Tank (ET-137) and twin Solid Rocket Boosters (SRBs) in High Bay 3 (HB-3). 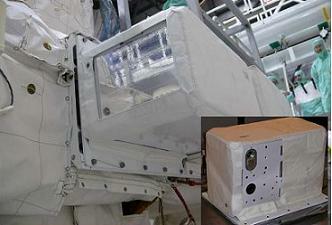 The addition of DragonEye sensor will be the third time an orbiter has provided assistance to SpaceX, following Endeavour’s role with the DragonEye Detailed Test Objective (DTO) box – with flash LIDAR and data acquisition unit – during STS-127, and the delivery of the Commercial Orbital Transportation Services (COTS) Ultra High Frequency (UHF) Communication Unit (CUCU) to the International Space Station by Atlantis on STS-129. 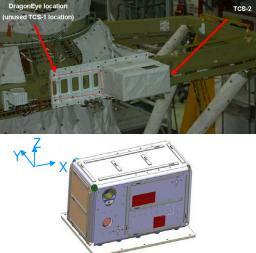 The DragonEye DTO was mounted to the Trajectory Control System-1 (TCS-1) carrier assembly on Endeavour’s ODS (Orbiter Docking System) starboard location, while the CUCU has already been installed and checked-out by ISS crewmembers. DragonEye provides three-dimensional images based on the amount of time it takes for a single laser pulse from the sensor to the reach a target and bounce back, providing range and bearing information from the Dragon spacecraft to the ISS. At the time of its debut, the SpaceX DE was one of two leading candidates for flash Light Intensification Detection and Ranging (LIDAR) relative navigation sensor to be used on the SpaceX Dragon vehicle. It’s inclusion on STS-133 is likely to be a final test run ahead of being fully implemented on the Dragon spacecraft – which will undergo its own first flight test on the next Falcon 9 flight (currently late September, but may slip further). With Discovery’s STS-133 launch date also slipping, currently NET (No Earlier Than) November 1, impacts to the installation of DragonEye on to Discovery – currently slipping two weeks due to a laser rod failure – is not a problem from a processing flow standpoint. “The Dragoneye payload was doing testing, during (which) the thermal vacuum test, there was degradation in their laser; the laser rod went all the way to failure,” noted Flight Operations and Integration (FO&I) on a recent Shuttle/Standup Integration report (L2). The replacement laser rod is understood to have checked out with no reported issues. Discovery is no stranger to testing out navigation aids for other vehicles, with her STS-131 flight also set up a test the STORRM (Sensor Test for Orion RelNav Risk Mitigation), ahead of a full test on STS-134 – which would be used for Orion’s docking to the ISS, although the vehicle has currently been demoted to the role of an ISS lifeboat. Should that remain the case, STORRM could be utilized to aid future commercial spacecraft that are set to visit the station in future years.